Thieves Steal Swedish Royal Jewels, Escape by Speedboat - Integration Through Media ....! 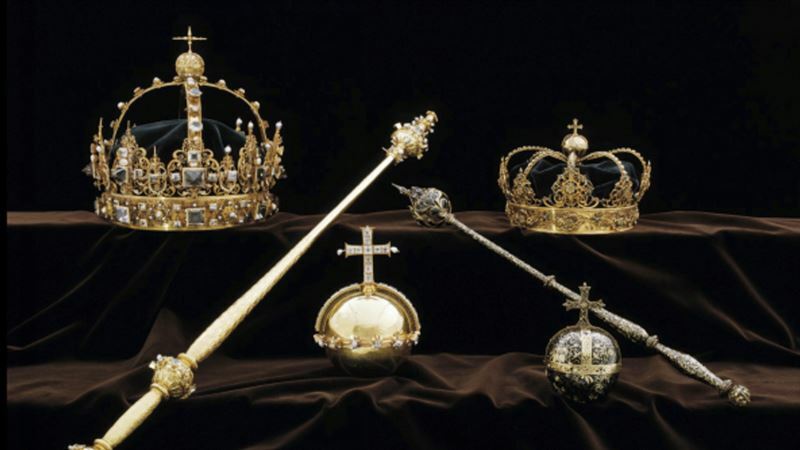 (VOA): Thieves in Sweden walked into a small town's medieval cathedral in broad daylight and stole priceless crown jewels dating back to the early 1600s before escaping by speedboat, police said Wednesday. Police sent out a helicopter and boat to hunt for the thieves but found nothing. Authorities said no one was hurt in the robbery, but didn't provide further details. “The two men hurriedly jumped on board and it sped off,” Rowell said, adding that they “appeared non-Nordic.” He didn't elaborate. On Wednesday, divers were looking for clues in and along the shores of Lake Malaren. Sweden's third-largest freshwater lake. Police said the thieves could have fled further on jet skis, adding it was only a theory. The stolen items are “impossible to sell” because of their uniqueness and high visibility, Maria Ellior of the Swedish police's National Operations Department told the Swedish news agency TT. Strangnas is a small, quiet town with a population of about 13,000. It's popular with Stockholm commuters and tourists, who come to see the cathedral and a street that has been called the prettiest in Sweden. The Gothic-style cathedral, built between 1291 and 1340, is in the heart of the town. The cathedral's red-brick tower with a black top can be seen from kilometers around. “It's despicable that people would steal from a holy building,” he said.